A Software Quality Analyst applies thoroughly the principles and practices of software quality in the software development process. 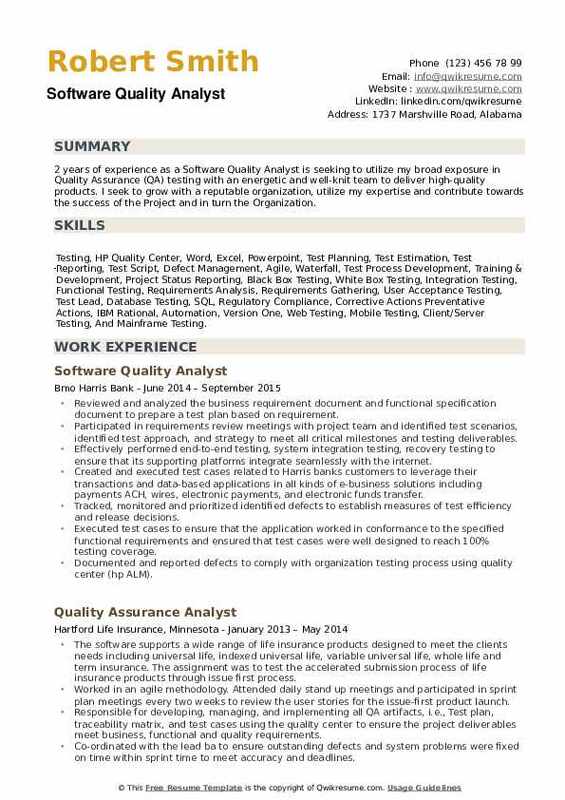 Responsibilities highlighted on the Software Quality Analyst Resume include troubleshooting and investigating defects in software applications, developing and implementing test plans in support of functional application areas, recording software defects and reporting the defects to the software developers, certifying the quality of applications, creating test strategies, determining program deviances and suggesting changes to modify them. 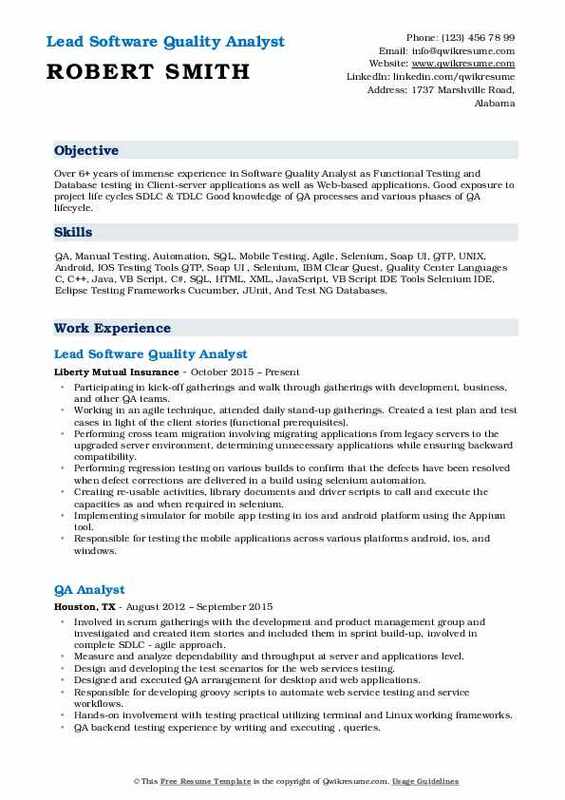 The most successful Software quality analyst’s underline complex skill sets such as a good understanding of software QA methodologies, knowledge of SQL and scripting, working experience in software quality assurance and software development and awareness of current trends and advanced technologies. 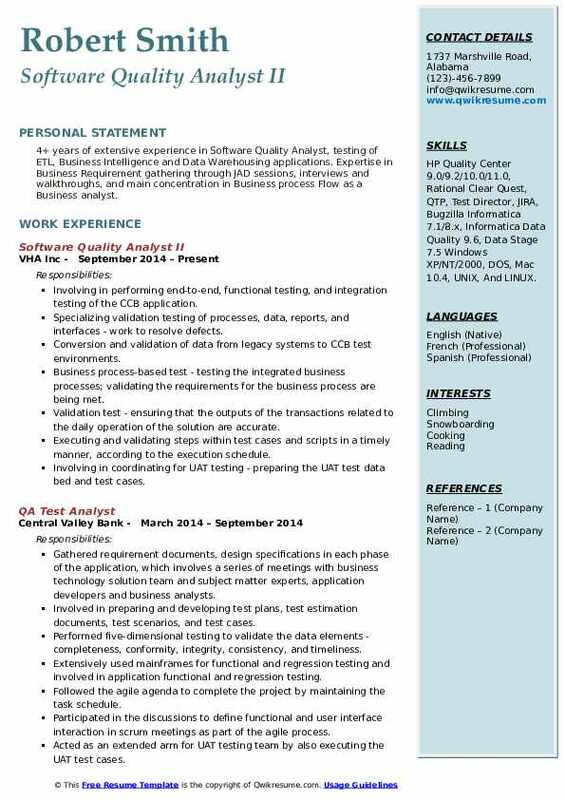 Companies require their Software quality analyst to have a Bachelor’s degree in Computer science or Software design or similar field. Summary : 3+ years of experience as a Software Quality Analyst is seeking to obtain a full-time position in a high-quality information technology environment. Skills : Testing Tools Selenium (IDE, Web Driver, Grid), Cucumber, SoapUI, Appium, JMeter, TestNG, JUnit, Jira, QC/ALM, Bugzilla. Quality Center/Test Director, Quick Test Professional (QTP), Unified Functional Testing (UFT), Silk Test, Rational Team Test (Clear Quest, Rational Robot, And Test Manager), PVCS Bug Tracking Tool, Compuware Tools (Test Partner), And QA Run. Preparing test plans, test scripts and test cases based on functional specifications and user requirements. Working on testing the application on different machines at the same time and with different web browsers (cross-browser testing). Analyzing and reporting bugs to a development team. And also reproduce the issues requested by the development team, re-testing the test cases after bug fix and updating test results. Performing data drove testing using selenium web driver, unit functions, and JDBC connections. Executing test scripts manually and reported defects using both excel template and quality center. Designing, building and executing automated test scripts using selenium web driver against web-based applications in Java language. Developing automation script for mobile native applications (ios, android) using opium, java. Used emulators and ios simulators to perform the manual mobile testing. Using a quality center (hp ALM) to create test scripts and executed in a test lab. Test web applications using selenium web driver and also tested mobile applications (ios and android) using Xcode ide and eclipse ide. Expertise in design and development of interfaces and conversion programs to integrate Oracle applications modules to import data from various sources into Oracle applications using pl/SQL stored procedures, functions, packages, database triggers and SQL loader scripts. Involving in testing the custom objects, custom tabs, validation rules, page layouts, compact layouts to suit the needs of the application in the requirements. 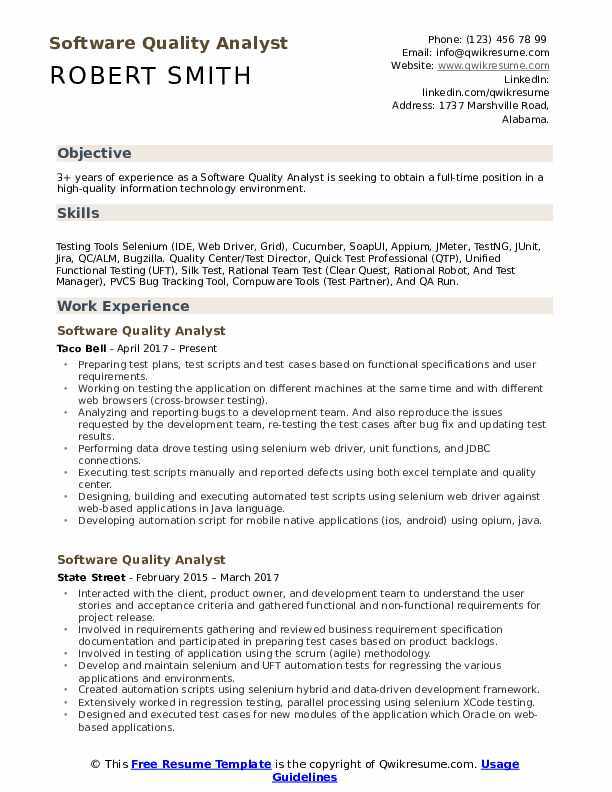 Summary : 14+ years of experience as a Software Quality Analyst is seeking to obtain a motivating and challenging position in an organization and apply my knowledge and use the professional experience to be a valuable asset to the organization. 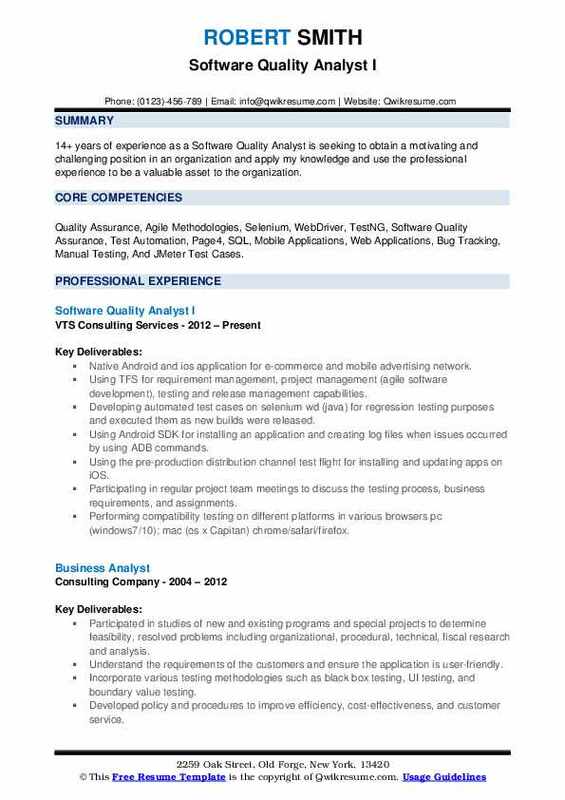 Skills : Quality Assurance, Agile Methodologies, Selenium, WebDriver, TestNG, Software Quality Assurance, Test Automation, Page4, SQL, Mobile Applications, Web Applications, Bug Tracking, Manual Testing, And JMeter Test Cases. Native Android and ios application for e-commerce and mobile advertising network. Using TFS for requirement management, project management (agile software development), testing and release management capabilities. Developing automated test cases on selenium wd (java) for regression testing purposes and executed them as new builds were released. Using Android SDK for installing an application and creating log files when issues occurred by using ADB commands. Using the pre-production distribution channel test flight for installing and updating apps on iOS. Participating in regular project team meetings to discuss the testing process, business requirements, and assignments. Performing compatibility testing on different platforms in various browsers: pc (windows7/10); mac (os x Capitan): chrome/safari/firefox. Creating selenium wd (java) test scripts to automate the build acceptance testing: scripts were written for all main functions including creating a new account, logging in, editing the profile, selection, and verification of different kinds of content. Running this test suit whenever a new build was released. Retrieved reports of running test cases by using the testing framework. Running multiple tests across different browsers, operating systems, and machines in parallel by using selenium grid 2. Participating in daily scrum meetings, discussed the application features and test cases. Digital textbooks, instructor supplements, distance learning courses, test preparation for specific academic disciplines and custom solutions. 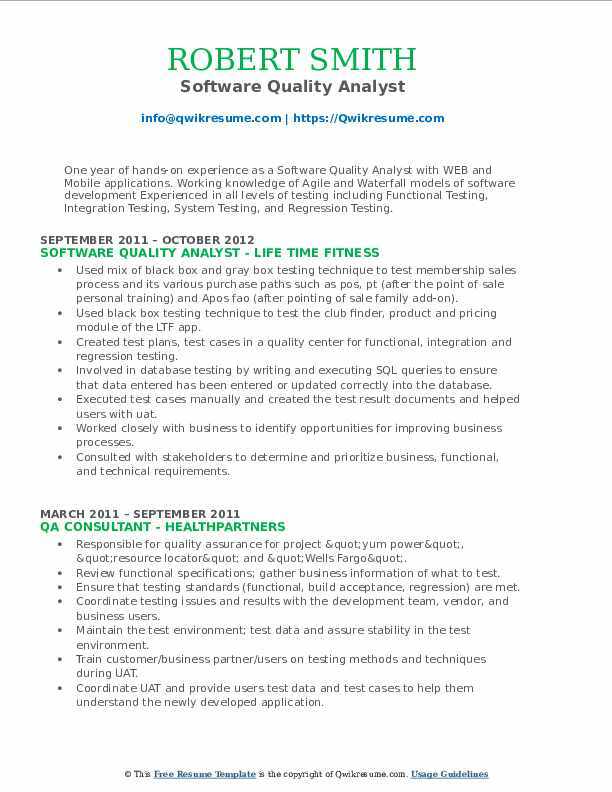 Objective : 3+ years of experience as a Software Quality Analyst and in testing activities. Experience in developing test scenarios and test cases using business requirements and design documents. Participating in requirement design document review sessions to evaluate requirements design documents from a quality testability standpoint. Performing functional, regression and integration testing of web-based, POS and mobile applications. Executing manual and automated functional testing based on analysis and understanding of the requirements and deploy environment. Performing regression testing to ensure release quality, user acceptance testing (UAT). Providing functional and integration testing to ensure futures are complete and function as expected. Designing and develop an automated test using, selenium and test complete for GUI tests. Creating a test automation framework with cucumber and selenium web driver. Designing and developing an automated test using a run scope for web service/API tests. 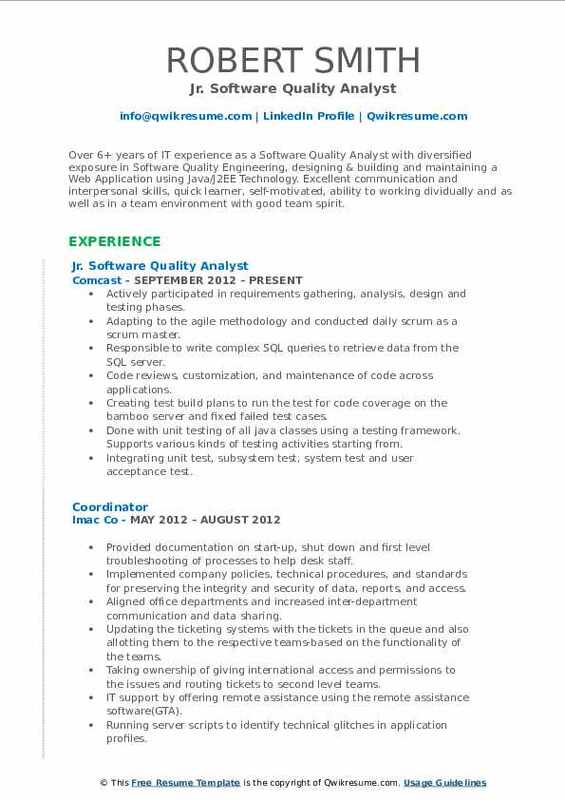 Headline : Over 6+ years of IT experience as a Software Quality Analyst with diversified exposure in Software Quality Engineering, designing & building and maintaining a Web Application using Java/J2EE Technology. Excellent communication and interpersonal skills, quick learner, self-motivated, ability to working dividually and as well as in a team environment with good team spirit. Skills : TestNG, HTML 5, CSS 3, Maven XML, JSP, MS Office, Microsoft Visio, Rational Rose, Cucumber, Bamboo, Splunk, My SQL, Jira, Spring MVC, TestNG, Windows, IntelliJ, Linux, My Eclipse, Ubuntu, And Mac OS X System. Actively participated in requirements gathering, analysis, design and testing phases. Adapting to the agile methodology and conducted daily scrum as a scrum master. Responsible to write complex SQL queries to retrieve data from the SQL server. Code reviews, customization, and maintenance of code across applications. Creating test build plans to run the test for code coverage on the bamboo server and fixed failed test cases. Done with unit testing of all java classes using a testing framework. Supports various kinds of testing activities starting from. Integrating unit test, subsystem test, system test and user acceptance test. Using cucumber framework to analyze the user-story and write acceptance criteria to develop test case scenarios. Have reported p1 level bugs on ios and Android devices, and was responsible to hold up a release. Maintenance of the system and updating of the system as per requirements. Establishing compatibility with third-party software products by developing the program for modification and integration. Coordinating with systems partners to finalize designs and confirm requirements. Objective : 4+ years of extensive experience in Software Quality Analyst, testing of ETL, Business Intelligence and Data Warehousing applications. Expertise in Business Requirement gathering through JAD sessions, interviews and walkthroughs, and main concentration in Business process Flow as a Business analyst. Skills : HP Quality Center 9.0/9.2/10.0/11.0, Rational Clear Quest, QTP, Test Director, JIRA, Bugzilla Informatica 7.1/8.x, Informatica Data Quality 9.6, Data Stage 7.5 Windows XP/NT/2000, DOS, Mac 10.4, UNIX, And LINUX. Involving in performing end-to-end, functional testing, and integration testing of the CCB application. Specializing validation testing of processes, data, reports, and interfaces - work to resolve defects. Conversion and validation of data from legacy systems to CCB test environments. Business process-based test - testing the integrated business processes; validating the requirements for the business process are being met. Validation test - ensuring that the outputs of the transactions related to the daily operation of the solution are accurate. Executing and validating steps within test cases and scripts in a timely manner, according to the execution schedule. Involving in coordinating for UAT testing - preparing the UAT test data bed and test cases. Getting sign off from the end users for the test cases that have been prepared for the UAT environment. Using hp quality center ALM 11 to log defects, and involved in almost all phases of defect cycle management. Using SQL Developer 3. 2. 2 for test data creation and back-end data validation. Responsible for validating the various batch jobs related to billing, meter uploads and meter read exceptions. Participating in daily defect triage meeting to help evaluate new and reopened defects discovered during the testing effort. Headline : Over 6+ years of immense experience in Software Quality Analyst as Functional Testing and Database testing in Client-server applications as well as Web-based applications. Good exposure to project life cycles SDLC & TDLC Good knowledge of QA processes and various phases of QA lifecycle. Participating in kick-off gatherings and walk through gatherings with development, business, and other QA teams. Working in an agile technique, attended daily stand-up gatherings. Created a test plan and test cases in light of the client stories (functional prerequisites). Performing cross team migration involving migrating applications from legacy servers to the upgraded server environment, determining unnecessary applications while ensuring backward compatibility. Performing regression testing on various builds to confirm that the defects have been resolved when defect corrections are delivered in a build using selenium automation. Creating re-usable activities, library documents and driver scripts to call and execute the capacities as and when required in selenium. Implementing simulator for mobile app testing in ios and android platform using the Appium tool. Responsible for testing the mobile applications across various platforms android, ios, and windows. Experience in utilizing android SDK group, test flight, x code, to install/uninstall and debugging mobile applications. Involving in accessibility testing used to test the application by various parts in order to test the entrance to various types of clients for various modules/joins in the application. Performing back-end testing by composing SQL inquiries to separate the precise information from the database. Experience in data analysis, data validation, data cleansing, data verification and identifying data mismatch. 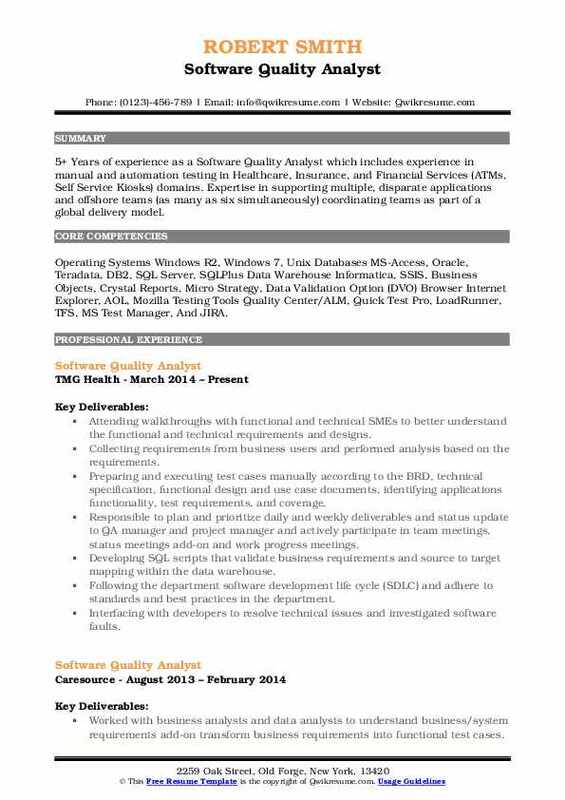 Objective : One year of hands-on experience as a Software Quality Analyst with WEB and Mobile applications. Working knowledge of Agile and Waterfall models of software development Experienced in all levels of testing including Functional Testing, Integration Testing, System Testing, and Regression Testing. Skills : MS Word, MS Excel, MS Project, MS PowerPoint, MS Vizio, MS SharePoint Server, MS Virtual PC (VPC), Adobe Photoshop, XML , VMware Reporting And Tracking HP Quality Center (QC) 10, Microsoft Visual Studio Team Foundation Server (TFS) 2008, Bugzilla, FogBugz, Automation, Testing Tools, Mercury Quick Test, Pro Databases, MS SQL Server, Operating Systems: Windows 64bit. Used mix of black box and gray box testing technique to test membership sales process and its various purchase paths such as pos, pt (after the point of sale personal training) and Apos fao (after pointing of sale family add-on). Used black box testing technique to test the club finder, product and pricing module of the LTF app. Created test plans, test cases in a quality center for functional, integration and regression testing. Involved in database testing by writing and executing SQL queries to ensure that data entered has been entered or updated correctly into the database. Executed test cases manually and created the test result documents and helped users with uat. Worked closely with business to identify opportunities for improving business processes. Consulted with stakeholders to determine and prioritize business, functional, and technical requirements. To review, analyze, and create detailed documentation of business system and user needs, including application workflow. To review user cases and other technical documents with the team to ensure business requirements are adequately reflected in technical planning documents. To analyze the business units activities and trends and compares analyses against service standards and best practices. To present findings and works with management and other personnel to identify and implement strategies that will address tactical and strategic goals. 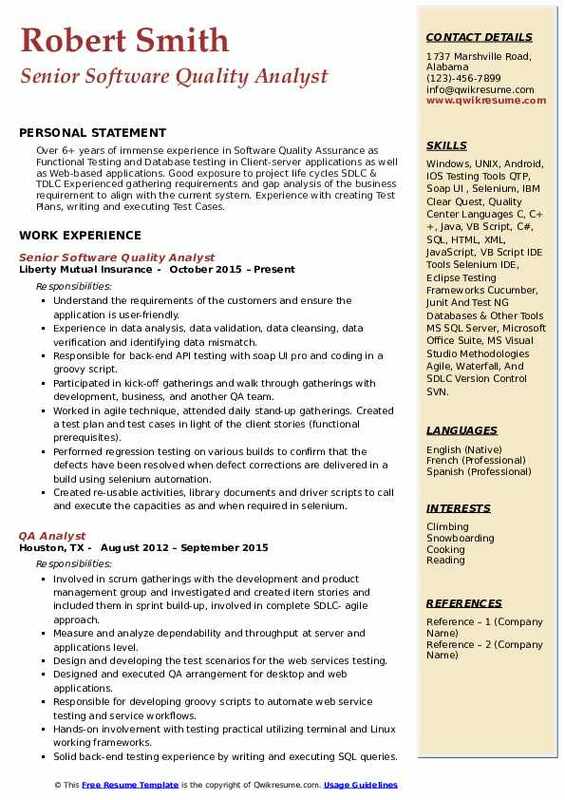 Headline : 5+ Years of experience as a Software Quality Analyst which includes experience in manual and automation testing in Healthcare, Insurance, and Financial Services (ATMs, Self Service Kiosks) domains. Expertise in supporting multiple, disparate applications and offshore teams (as many as six simultaneously) coordinating teams as part of a global delivery model. Skills : Operating Systems Windows R2, Windows 7, Unix Databases MS-Access, Oracle, Teradata, DB2, SQL Server, SQLPlus Data Warehouse Informatica, SSIS, Business Objects, Crystal Reports, Micro Strategy, Data Validation Option (DVO) Browser Internet Explorer, AOL, Mozilla Testing Tools Quality Center/ALM, Quick Test Pro, LoadRunner, TFS, MS Test Manager, And JIRA. Attending walkthroughs with functional and technical SMEs to better understand the functional and technical requirements and designs. Collecting requirements from business users and performed analysis based on the requirements. Preparing and executing test cases manually according to the BRD, technical specification, functional design and use case documents, identifying applications functionality, test requirements, and coverage. Responsible to plan and prioritize daily and weekly deliverables and status update to QA manager and project manager and actively participate in team meetings, status meetings add-on and work progress meetings. Developing SQL scripts that validate business requirements and source to target mapping within the data warehouse. Following the department software development life cycle (SDLC) and adhere to standards and best practices in the department. Interfacing with developers to resolve technical issues and investigated software faults. Preparing RTM document to ensure that all the requirements had sufficient coverage for thorough testing. Written test cases for ETL to compare source and target database systems. Interacting with senior peers/subject matter experts to learn more about the data. Ensuring that the mappings are correct and conducted data validation testing. Headline : Over 6+ years of immense experience in Software Quality Assurance as Functional Testing and Database testing in Client-server applications as well as Web-based applications. Good exposure to project life cycles SDLC & TDLC Experienced gathering requirements and gap analysis of the business requirement to align with the current system. Experience with creating Test Plans, writing and executing Test Cases. Understand the requirements of the customers and ensure the application is user-friendly. Responsible for back-end API testing with soap UI pro and coding in a groovy script. Participated in kick-off gatherings and walk through gatherings with development, business, and another QA team. Worked in agile technique, attended daily stand-up gatherings. Created a test plan and test cases in light of the client stories (functional prerequisites). Performed regression testing on various builds to confirm that the defects have been resolved when defect corrections are delivered in a build using selenium automation. Created re-usable activities, library documents and driver scripts to call and execute the capacities as and when required in selenium. Performed back-end testing by composing SQL inquiries to separate the precise information from the database. Performed cross team migration involving migrating applications from legacy servers to the upgraded server environment, determining unnecessary applications while ensuring backward compatibility. 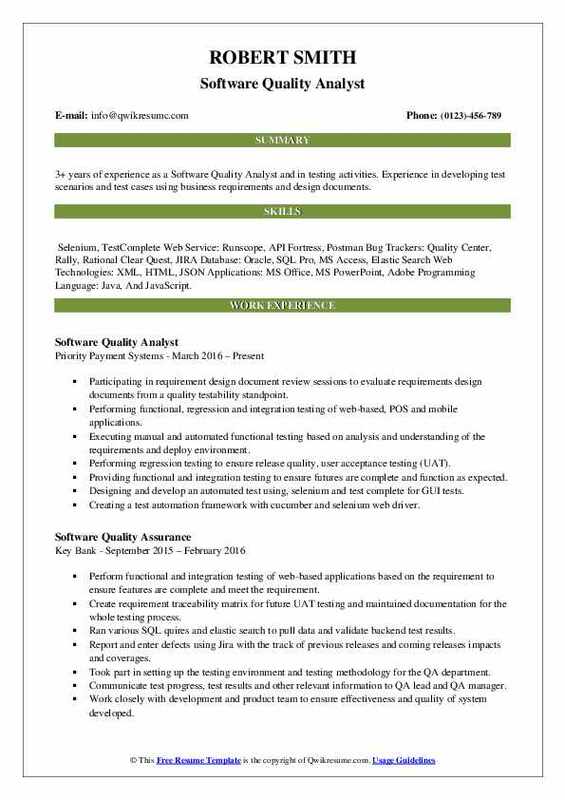 Objective : 2 years of experience as a Software Quality Analyst is seeking to utilize my broad exposure in Quality Assurance (QA) testing with an energetic and well-knit team to deliver high-quality products. I seek to grow with a reputable organization, utilize my expertise and contribute towards the success of the Project and in turn the Organization. Skills : Testing, HP Quality Center, Word, Excel, Powerpoint, Test Planning, Test Estimation, Test Reporting, Test Script, Defect Management, Agile, Waterfall, Test Process Development, Training & Development, Project Status Reporting, Black Box Testing, White Box Testing, Integration Testing, Functional Testing, Requirements Analysis, Requirements Gathering, User Acceptance Testing, Test Lead, Database Testing, SQL, Regulatory Compliance, Corrective Actions Preventative Actions, IBM Rational, Automation, Version One, Web Testing, Mobile Testing, Client/Server Testing, And Mainframe Testing. Reviewed and analyzed the business requirement document and functional specification document to prepare a test plan based on requirement. Participated in requirements review meetings with project team and identified test scenarios, identified test approach, and strategy to meet all critical milestones and testing deliverables. Effectively performed end-to-end testing, system integration testing, recovery testing to ensure that its supporting platforms integrate seamlessly with the internet. Created and executed test cases related to Harris banks customers to leverage their transactions and data-based applications in all kinds of e-business solutions including payments ACH, wires, electronic payments, and electronic funds transfer. Tracked, monitored and prioritized identified defects to establish measures of test efficiency and release decisions. Executed test cases to ensure that the application worked in conformance to the specified functional requirements and ensured that test cases were well designed to reach 100% testing coverage. Documented and reported defects to comply with organization testing process using quality center (hp ALM). Tested automated web services, wrote reports of findings and suggested changes, executed test cases using functional and load testing using SOAPUI. Performed cross-browser testing using different internet browsers e.g., Chrome, internet explorer, Mozilla, and Firefox to check browser related functional issues. Performed manual testing of the front-end, GUI, and functionality (black box), smoke, sanity, system, compatibility, and supported user acceptance testing (UAT). Performed regression testing after closing the defects and system enhancements to ensure that new codes did not adversely impact designed systems.